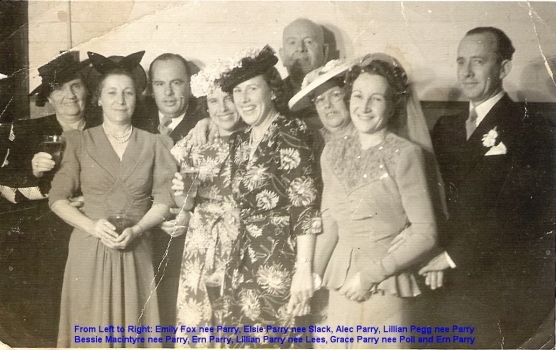 OZIGEN - Australian Genealogy - Left to Right: Emily Fox (née Parry), Elsie Parry (née Slack), Alec Parry, Lillian Pegg (née Parry), Bessie MacIntyre (née Parry), Ern Parry, Lillian Parry (née Lees), Grace Louise Parry (née Poll) and Ernest George Parry. Photograph provided by Lindsay Ainscow-Parry. Left to Right: Emily Fox (née Parry), Elsie Parry (née Slack), Alec Parry, Lillian Pegg (née Parry), Bessie MacIntyre (née Parry), Ern Parry, Lillian Parry (née Lees), Grace Louise Parry (née Poll) and Ernest George Parry. Photograph provided by Lindsay Ainscow-Parry.